This week we went to Arkansas and experienced lots of baby kicks! We changed it up a bit and decided to go by weight. At 29 weeks, our little one weighs almost 3 pounds! She is the weight of this used bag of flour. And let me tell you, for someone that hasn't gained much weight, I feel every extra pound! She loves wiggling and squirming all day long. ALL DAY LONG. At night I will sit on the couch and watch her dance her way across my belly. It's incredible that there is a living human inside of me! I've probably talked about it on so many posts but pregnancy continues to be such an unique experience! 1. I love the kicks. My daughter is alive and active and with me everywhere. 2. I dread the kicks. She is sitting on my bladder, literally. I have to get up 6-8 times a night because of it. And quite honestly, it hurts sometimes. Well, most of the time. It pinches and spasms and can be very shocking. Like the picture above, sometimes I feel like she is going to stretch through my skin. 3. I don't want it to stop. I love that my body feeds her, regulates her temperature and keeps her comfortable. I don't want her to be exposed to the world. I want to keep her safe inside of me. 4. And in the same breath, I can't wait to share her with the world! There are so many amazing people waiting to meet her. I get to be her caretaker but she isn't 'mine'. She is an individual worthy of sharing. So I will just enjoy, despise, love, hate, want, and relish these kicks for the remaining weeks. Michael and I took a little road trip to Arkansas. I've never been there before. Quite honestly, didn't even know exactly where it fell on the map. We were so excited to see our dear friends from our December Africa trip get married. We were there when they got engaged by the Nile River and now we got to share in their wedding celebration. It was great! Our road trip could not be complete without LOTS of snacks and good reading. This is my 3rd go-round with Ina May Gaskin's "A guide to Childbirth". I really love it. And Michael enjoys reading it to. I probably have 10+ natural birthing books on my shelf that I have read through multiple times but it is a whole different ball game when you are reading it pregnant. We are going to embark on the birthing adventure very soon! The wedding took place at an airport hanger. I love unconventional wedding locations! 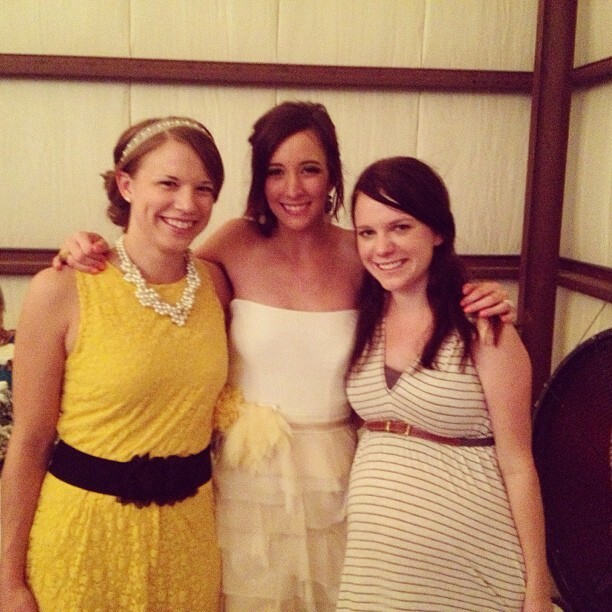 The beautiful bride, Chelsea, and another team member, Carla, who made her way from Indiana for the ceremony. Such a beautiful wedding and reception! This was the last of our travels before baby arrives. Now we get to 'rest', enjoy our birthdays, baby shower, birthing classes, and nesting in the remaining weeks.